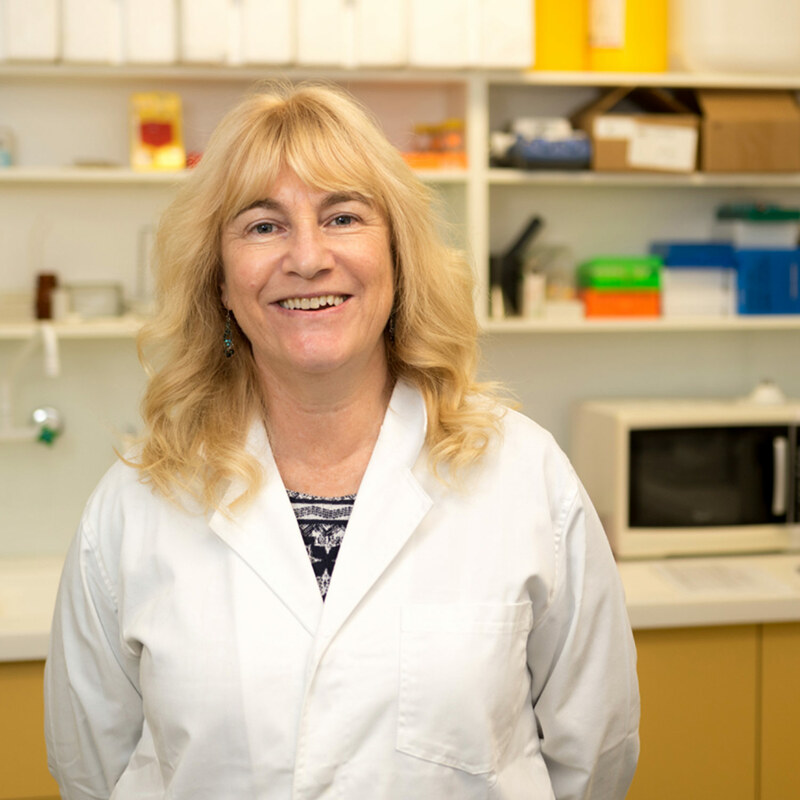 A mathematician in the School of Psychology, and Head of the Vision Sciences Group in the HMRI, Sally McFadden has dedicated over 30 years to Vision Science. 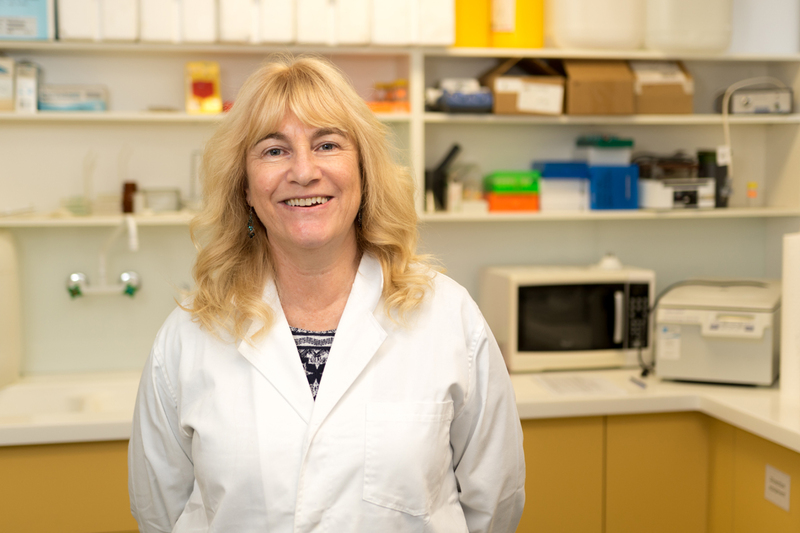 Sally’s research expertise in the area of Vision Science covers a range of methods including mathematical, physiological, psychophysics, optical, imaging, biological, surgical, immunohistochemistry, molecular and gene analysis, plus tissue engineering. “We are interested in the neurobiology underlying ocular disorders,” Sally says. Sally has made large contribution to Vision Science, being involved in the groundbreaking discovery that myopia is visually mediated as opposed to genetic. She also developed a mammalian model of myopia that is now utilised globally to conduct research in this field. Within the last generation, a global myopia epidemic has become apparent with 50 per cent of the world’s population expected to suffer from short sightedness by the year 2050. “Myopia is where you are short sighted, because your eye is too big and it grows too rapidly during development,” Sally says. Already the highest cause of blindness in Asia, it is predicted that by 2050, one thousand million people across the world will be affected by high myopia, the worst incarnation of this condition. By studying the mechanisms underlying myopia, the Vision Sciences group is working to design treatments and interventions to slow myopia progression. To stop the too-rapid enlargement of the eyeball that creates myopia, Sally’s team and collaborators have been developing pharmacological interventions as well as developing better spectacle and contact lens designs. High myopia can create lacquer cracks, staphyloma, unsustainable stretch or growth of the sclera, and ultimately detached retinas, which lead to myopic macular degeneration and complete blindness. To combat this, Sally is working on early detection of staphyloma, and repair of tissue within the sclera. “We know that in high myopia, the skin of the eyeball, called the sclera, remodels and changes, and the crosslinks that hold the layers together degrade, causing the layers to slide around,” Sally says. Although crosslink repair of the cornea has recently become common, Sally notes that her team and collaborators are forerunners in the quest to strengthen and repair crosslinks in the sclera at the back of the eye. Sally has also been investigating the efficacy of multifocal spectacle lenses designed to combat the shrinking in the periphery of the eye that accompanies myopia and that contain signals that slow eye growth. Another area of expertise for Sally is optical imaging. “We are trying to develop some new techniques for eye imaging because the current procedures have limitations in terms of imaging for myopic tissues,” Sally says. “Tantalizing treatment options to limit further global increases in the prevalence of myopia are emerging, but we still have work to do” Sally says. Sally also works on eye movements and attention, and pursues more esoteric projects when she has time in her busy research schedule. For example, she developed a way to map a person’s attention profile, which turns out to be like a personal IQ fingerprint. “I would also love to do a study which showed that if you spend time focused in the distance that there is a pathway that would actually relax you and change your mood state,” Sally says. But for now, myopia is the focus. The Vision Sciences group welcomes collaborations from those with interests or expertise in neuroanatomy, molecular biology, optometry, ophthalmology and surgery, physicists and biomedical engineers. The group also welcomes investors and companies interested in collaborations using a myopia model to develop and test treatments for myopia. 2010 Visiting Scholar Award, University of Alabama at Birmingham, USA. 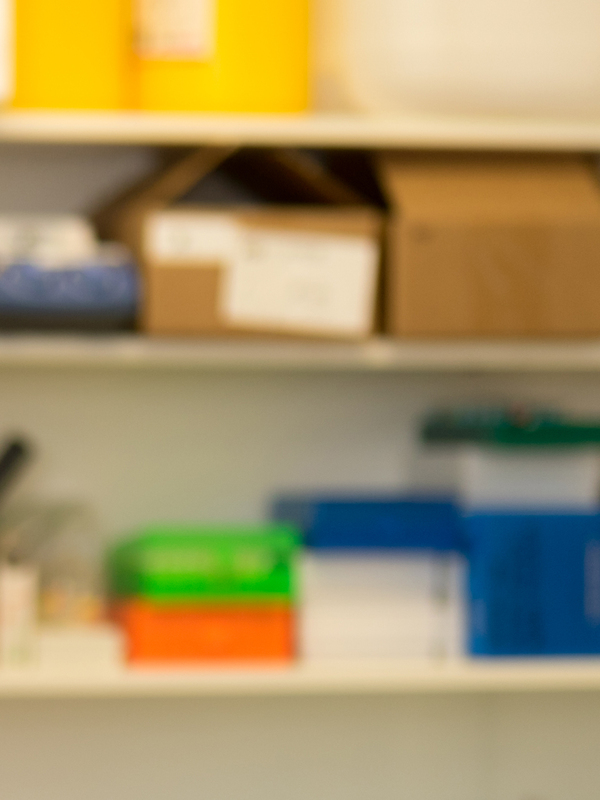 My research expertise is in the area of Vision Science using a range of methods including mathematical, optical, physiological, psychophysics, optical, imaging, biological, surgical, immunohistochemisry, molecular and gene analysis and tissue engineering. We are interested in the neurobiology underlying ocular disorders, and have developed effective models to study myopia and refractive disorders. A video highlighting one of our interests is shown here: https://www.youtube.com/watch?v=_77kaYMo2pw The Vision Sciences group welcomes collaborations from those with interests or expertise in neuroanatomy, molecular biology, ophtometry, ophthalmology and surgery, physicists and biomedical engineers. © 2018 The Authors. PURPOSE. Posterior scleral remodeling accompanies myopia. In guinea pigs developing myopia, the region around the optic nerve (peripapillary zone, PPZ) rapidly expands followed by inhibition in eye size in the periphery. We studied the differential gene expression in the sclera that accompanies these changes. METHODS. Guinea pigs were form-deprived (FD) for 2 weeks to induce myopia, while the fellow eye served as a control. After 2 weeks, the PPZ and the peripheral temporal sclera were isolated in representative animals to extract the RNA. RNA sequencing was undertaken using an Illumina HiSeq 2000, with differential expression analyzed using Voom and pathways analyzed using the Ingenuity Pathway Analysis tool. RNA from additional PPZ and peripheral temporal sclera in FD and fellow eyes was used for validation of gene expression using quantitative real-time PCR (qRT-PCR). RESULTS. In myopic sclera, 348 genes were differentially expressed between PPZ and the peripheral temporal region (corrected P < 0.05), of which 61 were differentially expressed in the PPZ between myopic and control eyes. Pathway analyses of these gene sets showed the involvement of Gai signaling along with previously reported gamma-aminobutyric acid (GABA) and glutamate receptors among numerous novel pathways. The expression pattern of three novel genes and two myopia-related genes was validated using qRT-PCR. CONCLUSIONS. Gene expression changes are associated with the rapid elongation that occurs around the optic nerve region during the development of myopia. A prominent change in Gai signaling, which affects cAMP synthesis and thus collagen levels, may be critical in mediating the regional changes in myopic sclera. © 2018 Myopia is generally regarded as a failure of normal emmetropization process, however, its underlying molecular mechanisms are unclear. Retinal protein profile changes using integrated SWATH and MRM-HR MS were studied in guinea pigs at 3- and 21-days of age, where the axial elongation was significantly detected. Differential proteins expressions were identified, and related to pathways which are important in postnatal development in retina, proliferation, breakdown of glycogen-energy and visual phototransduction. These results are significant as key retinal protein players and pathways that underlying emmetropization can be discovered. All raw data generated from IDA and SWATH acquisitions were accepted and published in the Peptide Atlas public repository (http://www.peptideatlas.org/) for general release (Data ID PASS00746). A more comprehensive analysis of this data can be obtained in the article ¿Integrated SWATH-based and targeted-based proteomics provide insights into the retinal emmetropization process in guinea pig¿ in Journal of Proteomics (Shan et al., 2018) . © 2018 Kashyap. The current study aimed to investigate the differential protein expression in Guinea pig retinas in response to lens-induced myopia (LIM) before fully compensated eye growth. Four days old Guinea pigs (n=5) were subjected to -4D LIM for 8 days. Refractive errors were measured before and at the end of the lens wear period. Ocular dimensions were also recorded using high-frequency A-scan ultrasonography. After the LIM treatment, retinas of both eyes were harvested and soluble proteins were extracted. Paired retinal protein expressions in each animal were profiled and compared using a sensitive fluorescence difference two-dimensional gel electrophoresis. The quantitative retinal proteomes of myopic and control eye were analysed using computerised DeCyder software. Those proteins that were consistently changed with at least 1.2-fold difference (P<0.05) in the same direction in all five animals were extracted, trypsin digested and identified by tandem mass spectrometry. Significant myopia was induced in Guinea pigs after 8 days of lens wear. The vitreous chamber depth in lens-treated eyes was found to be significantly elongated. Typically, more than 1,000 protein spots could be detected from each retina. Thirty-two of them showed differential expression between myopic and untreated retina. Among these proteins, 21 spots were upregulated and 11 were downregulated. Eight protein spots could be successfully identified which included ß-actin, enolase 1, cytosolic malate dehydrogenase, Ras-related protein Rab-11B, protein-L-isoaspartate (D-aspartate) O-methyltransferase, PKM2 protein, X-linked eukaryotic translation initiation factor 1A and ACP1 protein. The present study serves as the first report to uncover the retinal 2D proteome expressions in mammalian Guinea pig myopia model using a top-down fluorescent dyes labelling gel approach. The results showed a downregulation in glycolytic enzymes that may suggest a significant alteration of glycolysis during myopia development. Other protein candidates also suggested multiple pathways which could provide new insights for further study of the myopic eye growth. © 2018 Myopia is generally regarded as a failure of normal emmetropization process, however, its underlying molecular mechanisms are unclear. To investigate the retinal protein profile changes during emmetropization, we studied differential protein expressions of ocular growth in young guinea pigs at 3 and 21 days old respectively, when significant axial elongation was detected (P < 0.001, n = 10). Independent pooled retinal samples of both eyes were subjected to SWATH mass spectrometry (MS) followed by bioinformatics analysis using cloud-based platforms. A comprehensive retina SWATH ion-library consisting of 3138 (22,871) unique proteins (peptides) at 1% FDR was constructed. 40 proteins were found to be significantly up-regulated and 8 proteins down-regulated during emmetropization (=log2 of 0.43 with =2 peptides matched per protein; P < 0.05). Using pathway analysis, the most significant pathway identifiable was ¿phototransduction¿ (P = 1.412e-4). Expression patterns of 7 proteins identified in this pathway were further validated and confirmed (P < 0.05) with high-resolution Multiple Reaction Monitoring (MRM-HR) MS. Combining discovery and targeted proteomics approaches, this study for the first time comprehensively profiled protein changes in the guinea pig retina during normal emmetropization-associated eye growth. The findings of this study are also relevant to the myopia development, which is the result of failed emmetropization. Significance: Myopia is considered as a failure of emmetropization. However, the underlying biochemical mechanism of emmetropization, a visually guided process in which eye grows towards the optimal optical state of clear vision during early development, is not well understood. Retina is known as the key tissue to regulate this active eye growth. we studied eye growth of young guinea pigs and harvested their retinal tissues. A comprehensive SWATH ion library with identification of a total 3138 unique proteins were established, in which 48 proteins exhibited significant differential expressions between 3 and 21 days old. After MRM-HR confirmation, ¿phototransduction¿ were found as the most active pathway during emmetropic eye growth. This study is the first in discovering key retinal protein players and pathways which are presumably orchestrated by biological mechanism(s) underlying emmetropization. © 2017 The Authors. PURPOSE. It has been proposed that the peripheral retina, responding to local optical defocus, contributes to myopia and associated altered eye growth in humans. To test this hypothesis, we measured the changes in central (on-axis) and peripheral ocular dimensions in guinea pigs wearing a concentric bifocal spectacle lens design with power restricted to the periphery. METHODS. Five groups of guinea pigs (n = 83) wore either a unifocal (UF) spectacle lens (-4, 0, or +4 Diopters [D]), or a peripheral defocus (PF) spectacle lens that had a plano center (diameter of 5 mm) with either -4 or +4 D in the surround (-4/0 or +4/0 D). The overall optical diameter of all lenses was 12 mm. Lenses were worn over one eye from 8 to 18 days of age for negative and plano lenses, or from 8 to 22 days of age for positive lenses. Refractive error was measured centrally and 30° off-axis in the temporal and nasal retina. The shape of the eye was analyzed from images of sectioned eyes. RESULTS. Lenses of -4 D UF induced myopia, reflecting enhanced ocular elongation, which was centered on the optic nerve head and included the surrounding peripapillary zone (PPZ, 188 in diameter). Some ocular expansion, including within the PPZ, also was recorded with -4/0 and +4/0 D PF lenses while the +4 D UF lens inhibited rather than enhanced elongation, centrally and peripherally. CONCLUSIONS. Peripheral defocus-induced ocular expansion encompasses the PPZ, irrespective of the sign of the inducing defocus. Understanding the underlying mechanism potentially has important implications for designing multifocal lenses for controlling myopia in humans and also potentially for understanding the link between myopia and glaucoma. © 2017 Optical Society of America. Custom Spectral Optical Coherence Tomography (SOCT) provided with automatic quantification and distortion correction algorithms was used to measure the 3-D morphology in guinea pig eyes (n = 8, 30 days; n = 5, 40 days). Animals were measured awake in vivo under cyclopegia. Measurements showed low intraocular variability (<4% in corneal and anterior lens radii and <8% in the posterior lens radii, <1% interocular distances). The repeatability of the surface elevation was less than 2 µm. Surface astigmatism was the individual dominant term in all surfaces. Higher-order RMS surface elevation was largest in the posterior lens. Individual surface elevation Zernike terms correlated significantly across corneal and anterior lens surfaces. Higher-order-aberrations (except spherical aberration) were comparable with those predicted by OCT-based eye models. © 2014 The Association for Research in Vision and Ophthalmology, Inc. METHODS. To induce accelerated growth and myopia, guinea pigs wore a -5 diopter (D) lens over one eye from 4 to 11 days of age. To induce inhibited growth, the lens was removed after 7 days of -5 D lens wear, and the eye allowed to recover from myopia for 3 days. Ocular parameters and Egr-1 mRNA levels were subsequently assessed, and compared to untreated fellow eyes and eyes from untreated littermates. Possible circadian changes in Egr-1 mRNA levels were also determined in 18 additional animals by taking measures every 4 hours during a 24-hour cycle.PURPOSE. The immediate early gene Egr-1 is thought to form part of the pathway that mediates abnormal ocular growth. This study investigated whether the mRNA expression levels of Egr- 1 in a mammalian retina are modulated differentially, depending on the direction of ocular growth.RESULTS. Ocular compensation to a -5 D lens occurred after 7 days (D ¿ -4.8 D, D ¿ + 147 lm growth, N = 20). In 5 highly myopic eyes (¿ -7.4 D), Egr-1 mRNA levels in the retina were significantly downregulated relative to contralateral control (51%) and age-matched untreated (47%) eyes. Three days after the -5 D lens was removed, eyes had recovered from the myopia (¿ -0.5 D, relative change of + 2.9 D, N = 4) and Egr-1 mRNA levels were significantly elevated relative to contralateral (212%) and untreated (234%) eyes, respectively. Normal Egr- 1 mRNA expression was higher in the middle of the day than in the middle of the night. Immunolabeling showed strong Egr-1 reactivity in cell bodies in the inner nuclear and ganglion cell layers.CONCLUSIONS. Egr-1 mRNA levels in a mammalian retina show a bi-directional persistent response to opposing ocular growth stimuli. This suggests retinal Egr-1 might act as a signal for the direction of ocular growth in different species. Many lateral eyed birds are bifoveate or have dual retinal specialisations corresponding with their lateral and frontal viewing modes. For example, the eye design in the pigeon, which is typical of many granivorous birds, incorporates an optic axis for lateral distant viewing and a frontal area in the temporal retina associated with close binocular viewing. In this paper we ask how these two separate visual axis are used to focus on objects, not only at different eccentricities, but also at different absolute distances. Using simultaneous infrared (IR) photoretinoscopy and IR keratometry, we find that the pigeons optical system can indeed simultaneously support differential refractive states on the lateral and frontal axis. Maps of the refractive error (RE) and corneal power in cyclopleged and anaesthetized pigeons, reveal small but antagonistic gradients in different sectors of the visual field. In particular, we find that at rest, the frontal field is relatively myopic and yet the cornea has less power in this sector. We studied how these RE and corneal power maps actively vary during a reaching behaviour. We found that during the saccadic like peck response, the optic axis is not focussed on the grain and has only 30% of the required accommodation power. In contrast, we calculate that the frontal axis does have adequate power to focus on the grain. Furthermore, at the last stationary head fixation position (which occurs at an eye-grain distance of 67mm, SD=3.9mm) before the final descent when the eyes begin to close, accommodation on the frontal axis can be supported wholly by the cornea, which allows dramatic RE changes (-13D, SD=7.7) without unduly effecting the refractive error on the optic axis (-2D, SD=1.7). We propose that the shape of the cornea facilitates this local accommodation mechanism and that this dual visual system can be simultaneously focussed at disparate distances in space. The amplitude of saccadic eye movements is adjusted by the oculomotor system. If a target is surreptitiously moved during saccades so that the eye lands beyond the target, a gradual decrease in the saccadic gain (saccade-size divided by target-displacement) ensues. What error signals guide this adaptation? We propose that visual attention helps keep track of the target across saccades, so that saccade accuracy can be determined by comparing the location of the fovea with the locus of attention. If attention plays this role, saccadic errors might be more apparent when the size of the attentional field is small than when it is large. We tested this by a conventional saccade adaptation paradigm in which the target stepped 8Ã0and then stepped back by 30% during each saccade, while the subject did one of two psychophysical tasks demanding either a small or large attentional field. Specifically, the saccade target consisted of a large outer (8.5°) and a small inner (0.8°) ring, each with several breaks, rotating in opposite directions. After each saccade, the number of breaks transiently changed. Subjects reported the number of breaks present during this period in the attended ring. Saccadic gain was assessed both during adaptation and by comparing blocks of saccades before and after 250 adaptation trials using a spot target that disappeared upon saccade onset. After adaptation, saccadic gain had decreased four times as much if subjects attended to the small ring than to the large (small ring: -0.11, SD, 0.031; large ring: -0.027, SD, 0.038, paired t-test, p<0.01). Also, 4 of the 5 subjects had significantly negative gain slopes during the adaptation when attending to the small ring but none did when attending to the large ring. These findings argue that attention plays an important role in the adjustment of saccadic gain and suggest that the spatial scale of attention influences whether saccades are deemed to be accurate or in need of correction. © OSA 2016.We quantified anterior-segment geometry in both control and lens-treated eyes of a guinea pig model in vivo, using custom-developed optical coherence tomography. Myopic eyes showed longer axial-lengths, thinner corneas, longer anterior-chamber-depth and steeper anterior lens. © OSA 2016.Myopia is induced when growing eyes are exposed to hyperopic defocus or reduced vision. The associated changes and factors that influence the development of myopia in the guinea pig eye are described. 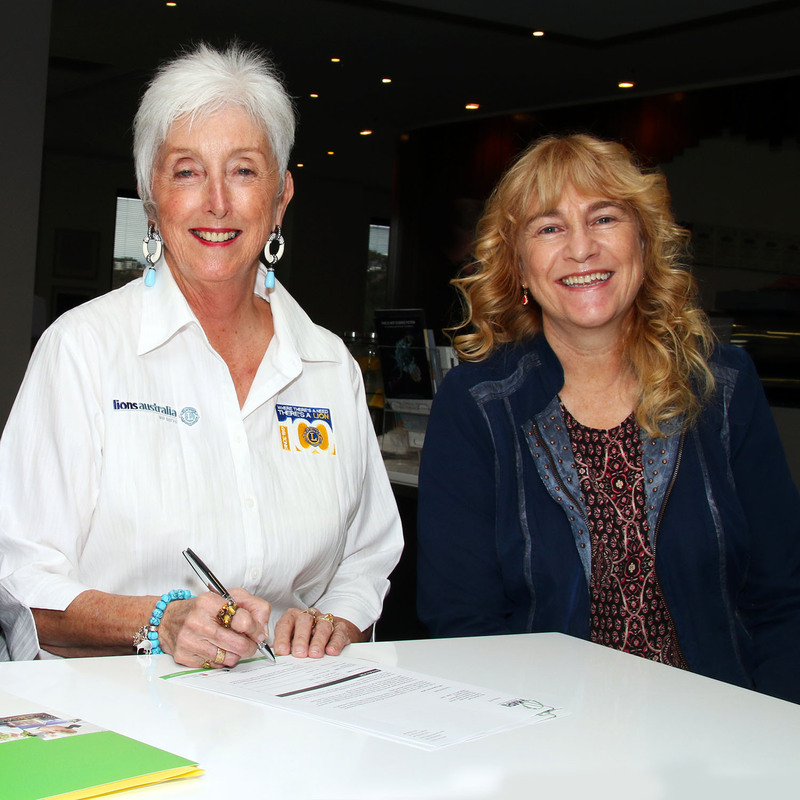 When Associate Professor Sally McFadden spoke at Dungog Lions Club in 2016 about her long-term research working at solving the riddle of myopia, her words travelled to Mrs Carole Powell, Lions Australia 201N3 District Coordinator.